This is one of the best salads I have ever had. I would suggest everyone eats this - often! YUM! So I have ALWAYS loved your blog, but now I love it even more!!! Your recipes are the BOMB, KEEP THEM COMING!!!! I love recipes and finding new things to make. I go to allrecipes.com ALL the time!!!! Anyway, I can't wait to see your LO, good luck girl!!!! That salad sounds delish. I may just have to make that for Mother's Day dinner. Yum! I agree with you about negative self image. I have been very surprised by all the layouts I have seen. I guess my personality is more like yours, if I am unhappy I will do something to change it...that goes for body image or life situations. Life is too short baby! I totally agree with all that you said about the takes on the challenge. You know, I'm not judging people who feel that way about themselves. I'm just saying, I don't get that. It's not something I can wrap my mind around. If I'm unhappy, I figure out why and then change it. If it's unchangeable, then I assume God is teaching me something through it. A purifying fire so to speak. I don't know....maybe that's the difference I guess. Faith. That recipe is making me hungry! I may have to try that this weekend! Thanks for sharing and hope you have a FABULOUS mother's day! Hey there! I'm loving how you decided to do your posts! Perfect! I know you mentioned photo processes, etc-- I would love to know how you did the color in the ones of your daughter with the easter egg mishap! Just beautiful! 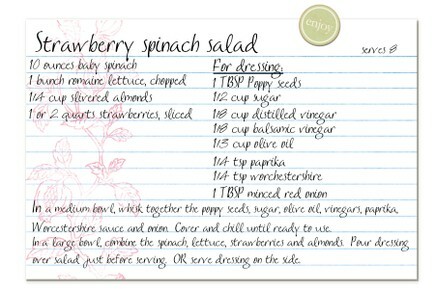 I'm going to try this salad out and those wonderful laundry tips! Seriously, loving this! Thanks so much and Happy Happy Happy Mom's Day to you! Great blog schedule - I agree about the money thing to - gotta blog to make it worth it! Love the last two posts!